Hot Spots in Cool Weather…. October’s almost gone and It's getting cooler. October’s almost gone and It’s getting cooler. My old worn-out jacket is feeling good as the kayak slips off the trailer and I head up the bayou. 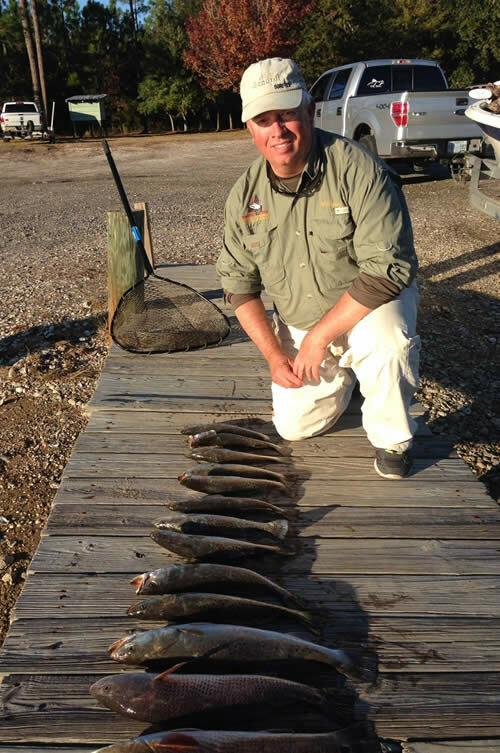 Yes Sir, Fall fishing is in full swing as these cold snaps push the Trout back to the rivers, creeks and bayous. Over the past couple of weeks I’ve probed my traditional winter Hot-Spots and they are Luke warm. Seems the warmer days followed by cooler nights have got the fish in what some people call a Yo-Yo pattern. They will move to the deeper holes on cool nights and then back to the flats on bright sunny warmer days. As the days get shorter and the temperature continues to drop, those deep holes will become a refuge for wintering Trout. Now instead of running up and down the beach from reef to reef searching for that school of fish, you might be able to narrow your point of attack. From now till December I usually start on the flats and work my way up at least three or four bends. I’m looking for contour changes but more especially I’m looking for bait. Often times bait will collect in the eddy currents near a bend. If you find bait in large numbers near deep holes, you should find trout. Right now it’s early and shrimp are still present. From now until the first frost I’m pitching a shrimp colored soft plastic and working it like a crippled shrimp. That is, a little faster than normal and I’m trying to bounce it up and down in the top third of the water column. As temperatures fall and shrimp get scarce the trout will switch to fin fish, this usually happens around mid November. By that time the water temperature has dropped to the lower sixties maybe even the high fifties. Under these conditions I’m pitching a sinking or suspending hard plastic lure like a MirrOlure or Rapala. It’s much cooler now and the fish are sluggish. Trout are hugging the bottom and looking up for an easy ambush. It’s getting into early winter and the fish are not busting the surface, they are looking for easy pickings. To be successful you’ve got to slow you’re presentation way down. For instance if I’m pitching a Husky Jerk, I’ll use a three or four second pause after each twitch. I know this seems excessive, but given the right conditions it can produce a solid strike. I can only describe this strike as similar to the top water strike. Just like using a top water bait I wait to feel the tug after the hit. Sometimes it’s a kill strike without a tug and it takes a strong will to just freeze you’re hands. Last year I limited out several times in cold weather using this very technique. Yes Sir, cooler weather can produce hot spots if you’re willing to put in the time and seek them out.